So, there's this wonderful game I want to do for the 2-player print-and-play contest over at boardgamegeek. It's an interesting theme, based on the movie 2010: The Year We Make Contact, where both players are essentially "trapped" on a deep space mission together from competing countries. They need to trust each other, and work together, to make the mission succeed, but as news slowly winds itself through space to the probe that tensions are mounting back home, the trust starts to break down, as victory conditions start changing for each player. It could be fascinating, interesting, and different (at least in my mind). But I don't have time for that now. So I decided to try my hand at a tiny card game (since I like working with oddball restrictions), ala "Love Letter" which I haven't played...but I get the general gist of it. Current set of rules and 15 print-and-play card are here in GoogleDrive. It just needs a few playtests to see if it runs at all.There's a wonderful chance that the game is a complete disaster...like most first prototypes. The deck is comprised of three suits...and each suit has the same set of wacky action cards. One card is removed from the game. The goal of the game is to determine the color of the card that was removed, with scores based on owning cards in your hand that match that color at the end of the game. A player's turn is simply: A) optionally playing a card out of his hand and performing the action on the card, followed by B) drawing a card from the deck. If at any point a the draw deck has no cards when the player is required to draw a card, then the player may optionally end the game. Scoring is based on matching the card color of the removed card with your cards in your hand at the end of the game. Now, scoring has some unique tricks to it. Scoring is designed to prevent card hoarding. You score points for having cards in your hand that match the target color, AND for cards that don't match the target color in your opponent's hand. In general, the scoring should "play" with the player's perception of what they need to do in the game...in this case, since the player wants to find out what the missing card is, he wants to see as many cards as possible, but since scoring penalizes card hoarding, he wants as few cards in his hand at the end of the game as possible. Which should create an interesting dynamic. Initially the card actions were simple: "draw an extra card" "shuffle the discards back in the deck". Most of the actions have been re-thought using ideas based on the Cut-The-Pie problem (one person cuts the pie, the other person decides who gets what piece). This was done for a few reasons; it adds more "weight" and more decisions to the game while keeping the component count really low. 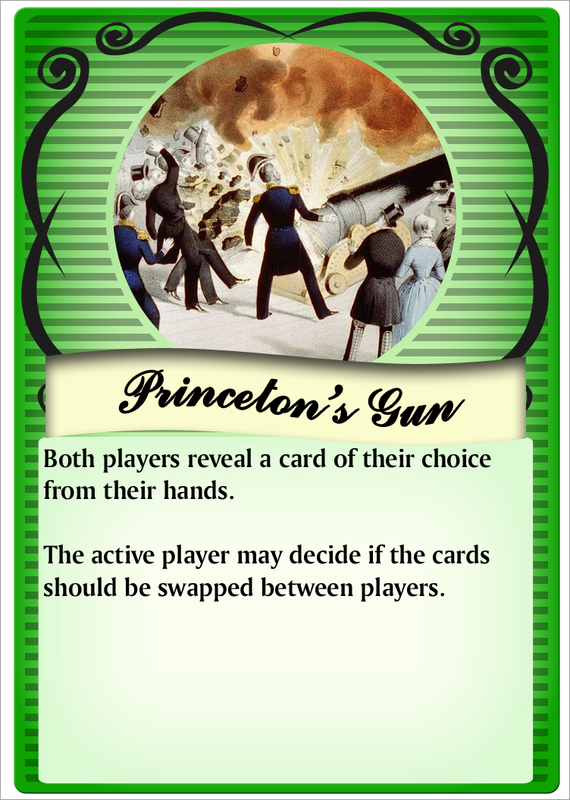 And two, it gives each card some specific ways to be used slightly differently depending on the stage of the game where the player is at. As mentioned above, the game can be thought to have two stages, the initial find-the-missing-card stage, followed by the hand-building-and-point-forming stage. 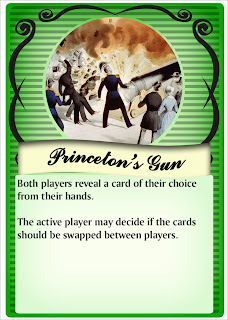 And by giving the actions multiple levels of decisions, the cards can be used differently in each stage. An additional, quieter side effect of the actions is the way the player can control the game speed. Remember, the game can possibly end when player cannot draw a card (ending the game with that player's discretion). By giving the players some control of feeding cards back into the draw deck, or how many cards that can be drawn, the players can control that speed outside of the realm of simply deciding to end it. Of course, there are potentially issues with regards to recursive card action and card play that can never end the game. Hopefully I've caught those. But I wouldn't be surprised if there's some trick somewhere in there I missed. That's the dangerous side of letting the players control the speed and end game of the game; the playing for the draw, or just flat out breaking the game. On a final note...I once read something about comic strips, that in a lot of ways drawing comic strips are harder than traditional artwork or comic books, because of the level of tolerances and the amount of lines drawn will reveal any mistake on a comic strip character as a much larger flaw than a slightly altered line in a more detailed model. For example, if there is one line that isn't juuuust right on Charlie Brown, you see it immediately as an error. I have a feeling that small games like this are similar. I don't think there's a case of "well, if you just tweak this one little rule a little bit, it will be fixed." Small games either work, or are a complete disaster. At least that's my story right now, and I'm sticking with it. This sounds like a really neat idea, and I think it could be made to work, but I think there's a significant flaw in the assertion that there are 2 stages to this game - figuring out the color of the removed card, and building your hand. 2 stages implies an order, but you really have no way to determine the color of the removed card until the very last cards come out, even with looking at the opponent's hand. I think the key is going to be finding a way to allow players to make reasonable deductions as to the identity of the target color. Also, unless it changed from what you had the other day in chat, the scoring doesn't really reward deducing the color so much as it rewards having fewer cards in hand than the opponent. If you really want the game to be about deducing the color of the target card, then I think you need to rework the scoring (and find a way to let players figure it out).